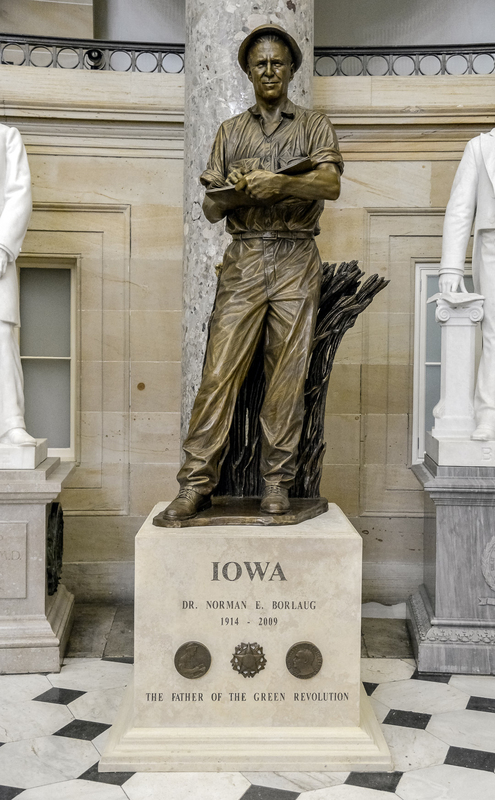 This statue of Dr. Norman E. Borlaug was given to the National Statuary Hall Collection by Iowa in 2014. Borlaug's statue replaced a statue of James Harlan, which Iowa had donated in 1910. Norman Ernest Borlaug was born on March 25, 1914, on a farm near Cresco, Iowa. An energetic and inquisitive youth, he completed high school—unusual in that place and time—and then worked his way through the University of Minnesota. He never forgot his arrival in Minneapolis–St. Paul in 1932 during the Great Depression, when hungry, desperate people begged for food and were near rioting; that memory and his 1935 experience in the Civilian Conservation Corps, where many of the people who worked under him were starving, would have a profound influence on his life’s work. After receiving a bachelor’s degree in forestry, he worked for the U.S. Forest Service in Massachusetts and Idaho and then returned to his alma mater, earning a master's degree in 1940 and a doctorate in plant pathology and genetics in 1942. He worked first as a microbiologist investigating fungicides and preservatives for the du Pont de Nemours Foundation and then as a geneticist and plant pathologist for the Cooperative Wheat Research and Production Program, a joint project of the Mexican government and the Rockefeller Foundation; in the latter position he developed mutation techniques that adapted crops to specific climate regions. His accomplishments led to dramatic increases in crop yields in Latin America, the Near and Middle East, Africa, and Asia. This also helped reduce deforestation, for growing more food no longer required creating more farmland. Dr. Borlaug was later made director of the International Wheat Improvement Program, in which he taught research and production methods to young scientists. He established the World Food Prize Global Youth Institute to give highschool students the opportunity to learn about food security and fighting hunger. He traveled to many famine-stricken regions around the world, working with scientists and governments to bring the benefits of agricultural science to local farmers. In 1984 he became a Distinguished Professor at Texas A&M University, a position he held for the rest of his life. Throughout his career, Borlaug was well served not only by his education and intelligence but also by the capacity for hard physical exertion that he had developed as an Iowa farm boy and displayed as a star wrestler in high school and college. Prolonged time in the field was a major part of his work; in fact, he was working in a wheat field outside Mexico City when he learned that he was to receive the Nobel Prize. Characteristically humble, he first believed that the announcement was a joke. When convinced that it was true, he decided to keep working and celebrate later. Borlaug remained active and interested in the challenge of feeding the world’s increasing population throughout his life. For his achievements in this field, he became one of only three Americans (and seven people worldwide) awarded the Nobel Peace Prize (1970), the Presidential Medal of Freedom (1977), and the Congressional Gold Medal (2007). He was also recognized by humanitarian and professional organizations and by governments around the world, including honors from the United Nations, Canada, Mexico, Norway, Hungary, India, and Bangladesh as well as the United States. A wing of a science building at the University of Minnesota bears his name, as do a building at Texas A&M University and an Iowa City elementary school; the Dr. Norman E. Borlaug Hall of Laureates in Des Moines, Iowa, is the home of the World Food Prize, the organization Dr. Borlaug created to be the equivalent of a "Nobel Prize for food and agriculture." He was especially satisfied when the people of Ciudad Obregón in Sonora, Mexico, where he did some of his first experiments, named a street for him. He died at the age of 95 on September 12, 2009, at his home in Dallas, Texas. The statue of Dr. Borlaug was unveiled in National Statuary Hall on March 25, 2014, the centennial of his birth. It replaces one of college president, United States Senator, and Secretary of the Interior James Harlan, which the state of Iowa donated to the National Statuary Hall Collection in 1910. Benjamin Victor (1979–), who works in South Dakota, is also represented in the National Statuary Hall Collection by the bronze statue of Sarah Winnemucca donated by the State of Nevada in 2005.